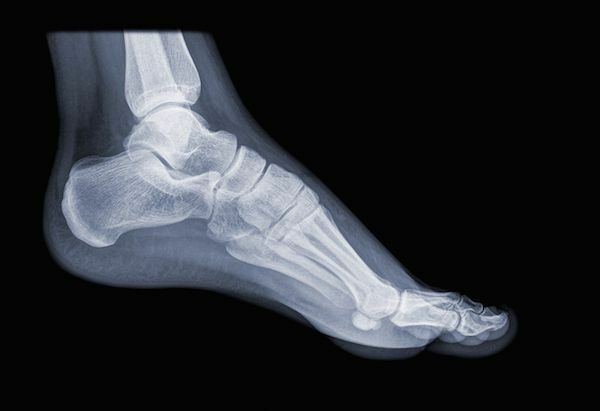 Ultrasound and X-Rays for Foot Care | Podiatry Associates, P.C. Problems are so much easier to address when you can see them clearly. Think about trying to get dressed or find a missing object in the dark. Sight help so much—and it’s incredibly helpful for medicine as well. The problem is that it’s hard to see many issues in the human body. Skin obviously prevents it. That’s where diagnostic images like ultrasound and X-rays come into play. Ultrasound diagnostics, also called sonography, are imaging tests that use high-frequency sounds waves to capture real-time pictures of soft tissues in your body. This allows the technician to “see” inside you and observe your tissues and how they move. Bouncing sound waves has been used for decades as a safe way to check a baby’s development in the womb without. What you may not have realized, though, is that this medical tool isn’t just for expecting mothers. It’s a diagnostic test for soft tissue problems throughout the body, including in the lower limbs. Podiatry experts like Dr. Cynthia Oberholtzer-Classen use these focused sound waves to diagnose and treat lower limb conditions. It works by directing powerful, too-high-to-hear sound waves at your feet. These waves bounce back off your tissues at different times and lengths, allowing them to be perceived and translated by a receiver. The receiver converts the information from sound waves into a “video” of pictures. The whole test is entirely painless, and there aren’t any side effects. X-rays have been used in medicine to take pictures of tissues for decades. They are beams of low-level radiation that pass through your body and collect on film or digital receivers behind you. Because different tissues absorb different levels of radiation, your limbs create a “shadow” of sorts on the film, clearly showing bones and, to a much lesser degree, some soft tissues. The densest materials, like bone, show up white on the X-ray. Soft tissues like fat and muscle appear grey and indistinct. Air and hollow spaces appear black. This allows technicians to see breaks, alignment issues, spurs, and other bone-related problems in the body. For your ultrasound, one of our staff members will apply a thin layer of gel to the area being checked. This helps the sound waves transmit easily through your skin. Then the probe that produces the sound waves will be placed directly on your foot. The images will be recorded and used to diagnose your condition. Since this test is able to observe soft tissues and motion, it can “see” and evaluate problems that other tests, like X-rays, would miss. Our team then examines and uses the images to get you the treatment that you need. X-rays are different. Each exposure creates a single picture at one angle that is captured either on film or by digital receivers, depending on the machine. Often experts like our team need multiple exposures to create pictures at different angles and highlight different things. Our team will arrange your foot and cover the rest of you with lead aprons for protection. You’ll be exposed to a small, short burst of X-rays. The pictures will then be developed and evaluated to identify your condition. This test is also safe and painless. The amount of radiation used is very small, so a few X-rays at a time won’t cause damage. The ability to see bones and soft tissues inside your foot is incredibly beneficial. Ultrasound specifically can help with a variety of conditions. It can locate and determine the size of a Morton’s neuroma, tumor, or cyst. It can identify bursitis or capsulitis around joints. It’s commonly used to evaluate tendon or ligament injuries, particularly if there might be a tear. In some cases, it can identify the extent of a condition like plantar fasciitis. X-rays tend to be more limited to bone-related problems. Checking for fractures is one of the most common uses. They can also help identify deformities, like bunions or Charcot foot, and determine how serious they really are. They can locate bony protrusions and give a better look at congenital conditions like clubfoot and tarsal coalition. X-rays have been used very successfully for treating lower limb conditions for a very long time. The ability to accurately diagnose a painful condition is important. It helps experts like our team at Podiatry Associates, P.C. form a targeted plan to treat your condition. Don’t ignore foot pain because you’re afraid of what it might be. Contact our Castle Pines or Parker, CO, offices for an appointment or more information about diagnosing and eliminating uncomfortable conditions.